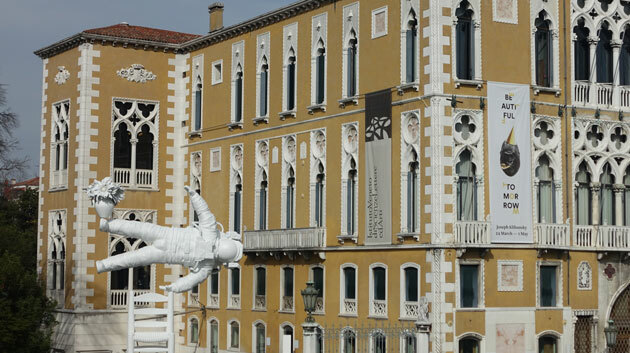 Venice isn’t a city renowned for being budget friendly. 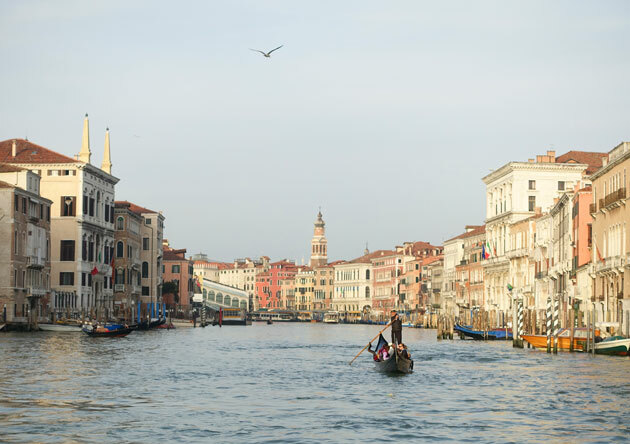 Its iconic gondola rides will set you back 80 Euro for an hour – $120 Aussie Dollars for anyone who’s not familiar with the conversion rate. 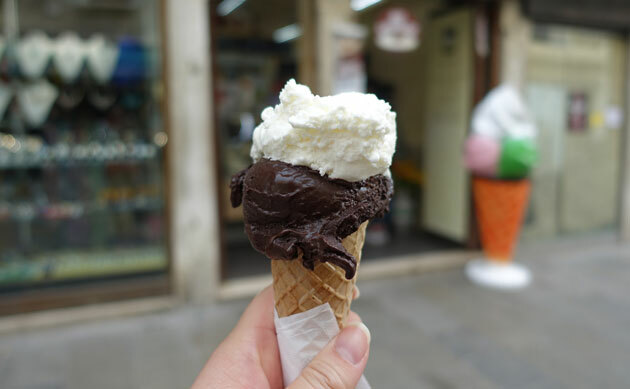 Even a gelato cone is about 1 Euro more expensive than anywhere else in Italy! Hotels aren’t cheap either. Our hotel room located a little further out of the centre cost us about $220 a night, and there weren’t that many non-hotel options to choose from. 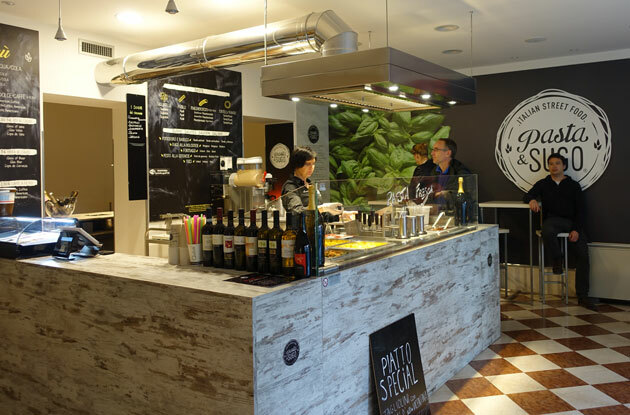 Dining out at a proper restaurant with tablecloths can be expensive as well, with cheap dinners for two costing anywhere from 50 Euro – $75 Aussie Dollars for uncertain quality! 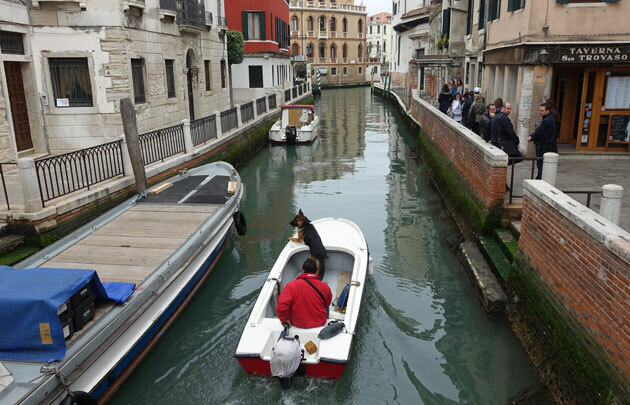 Still if you want to visit Venice (and most people do! 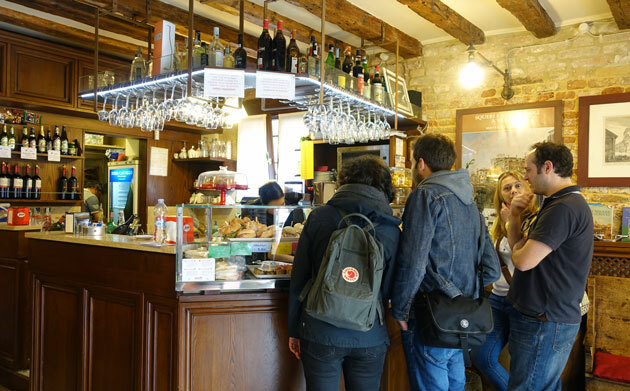 ), you can dine out on a smaller budget…just follow the locals to one of the many small bars around the city serving cicchetti. 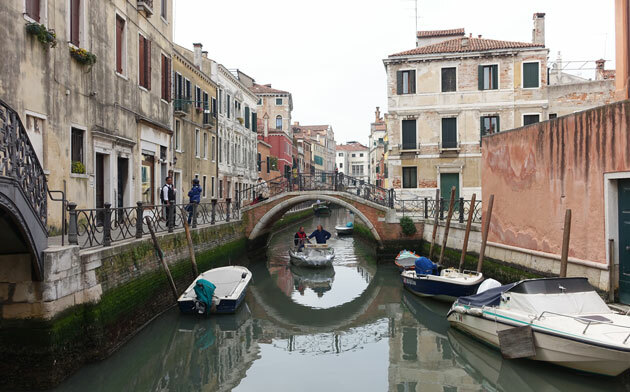 We went to Osteria Al Squero for lunch on our one full day in Venice after seeing a few groups of locals perched on canal-side wall outside with drinks and little plates of cicchetti. 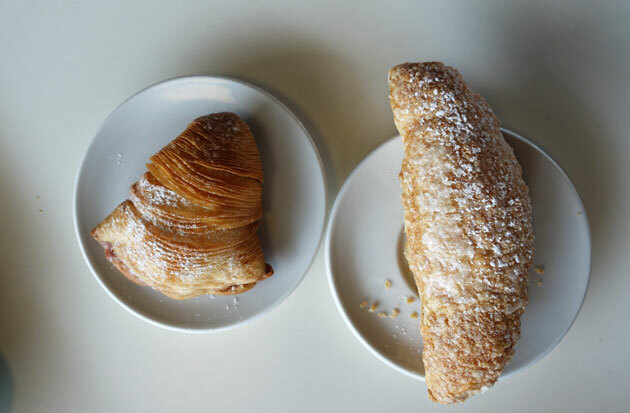 We ordered some cicchetti for lunch from the counter inside – they have about a dozen different options to choose from, and countless drinks too. 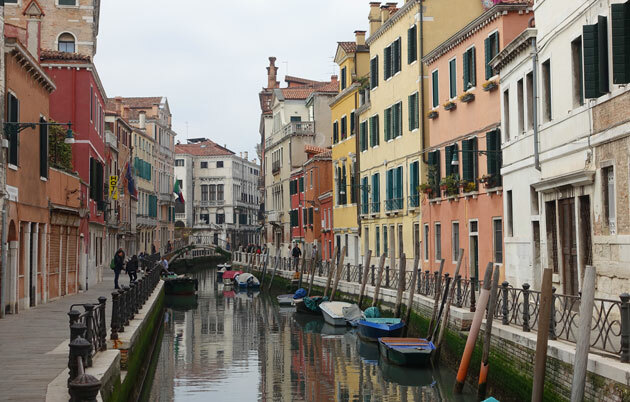 The drink of choice in Venice is prosecco or a spritz made with Aperol or Campari, which will normally set you back about 2 to 3 Euro. No matter where you go, you’ll see locals at bars with glasses of orange-coloured cocktails in hand. 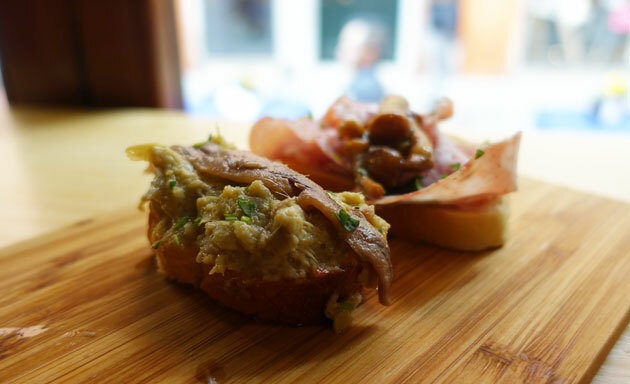 So what exactly are cicchetti? 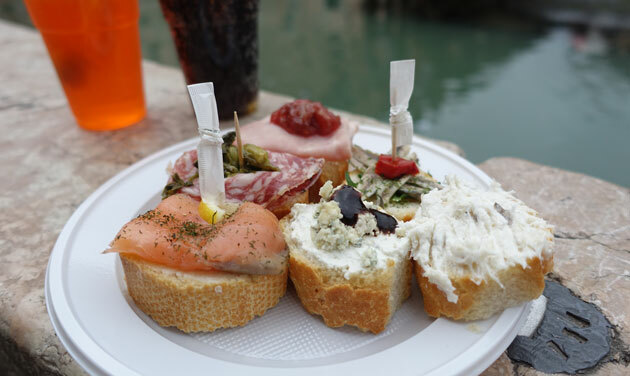 They’re a Venice speciality not unlike Spanish tapas or Danish smorrebrod – just don’t let any Venetians hear you say that! 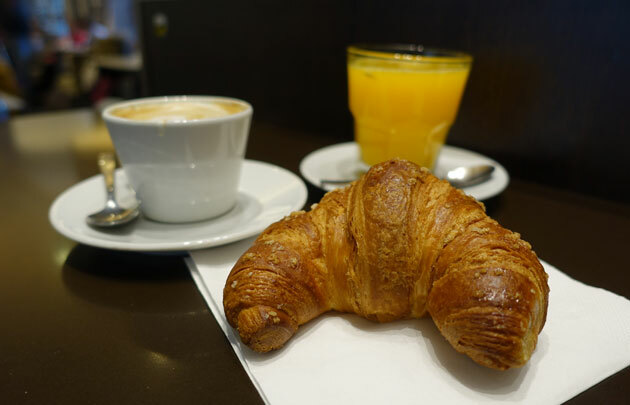 Normally it’s just slices of French baguette with a range of different toppings on them to suit any tastes (no vegans or gluten-free though!). Sometimes fancier bars will make little pastries or similar, but for the most part they will keep it simple with cold toppings. 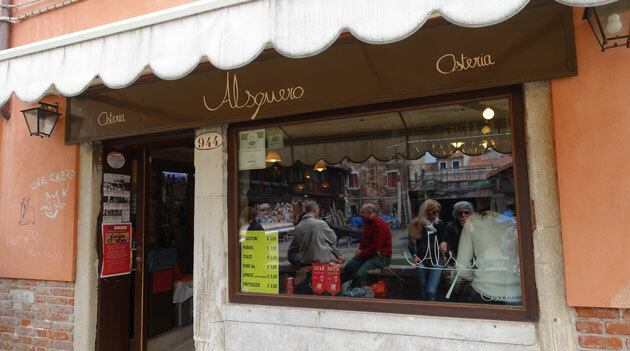 Osteria Al Squero’s cicchetti’s are priced at 1.20 Euro a piece, a comparative bargain in expensive Venice. 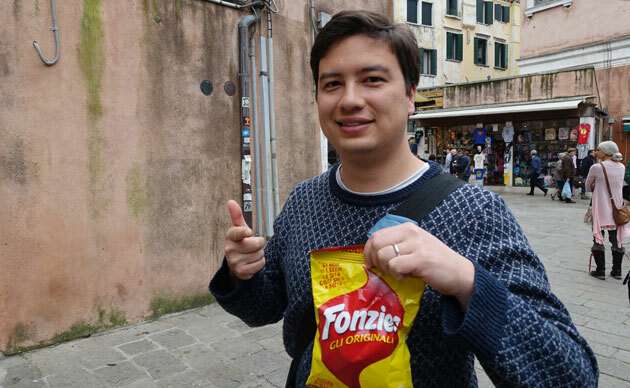 Most people seemed to be ordering three cicchetti each as a light lunch so that’s what we opted for as well – six in total. I chose a smoked salmon with lemon, a salami with pickle, and a ham with chutney. K chose a sardine, a gorgonzola, and a codfish. All were surprisingly fresh despite sitting in the display cabinet so I imagine the turnover is quite fast. My pick was the combination of the spiced chutney with ham – simply superb. 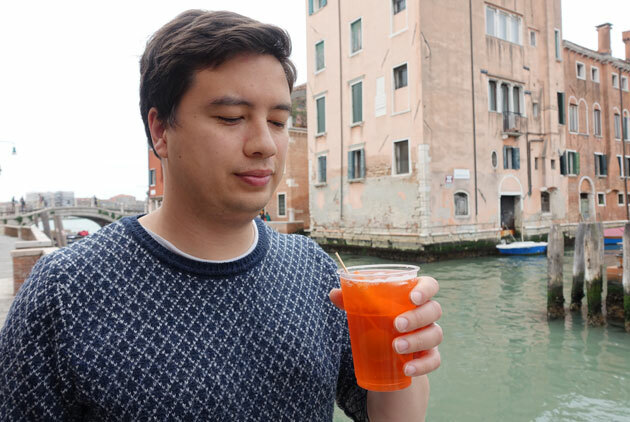 K enjoyed his Aperol Spritz, but did find it rather strong. It had been described to us as prosecco mixed with sparkling water and a dash of Aperol. 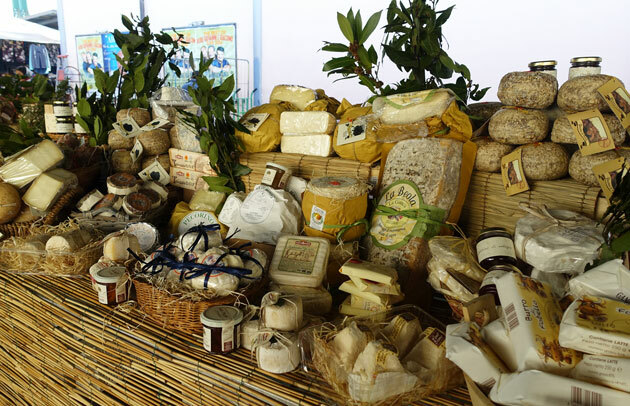 However, Osteria Al Squero makes it with equal parts of all three which is enough to make anyone’s head spin! 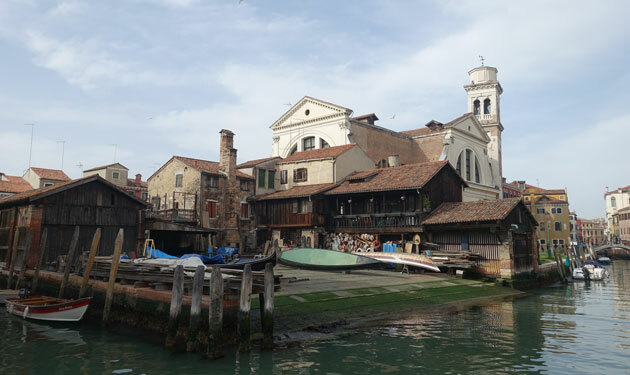 Osteria Al Squero is located at 943/944 Dorsoduro in Venice, Italy. 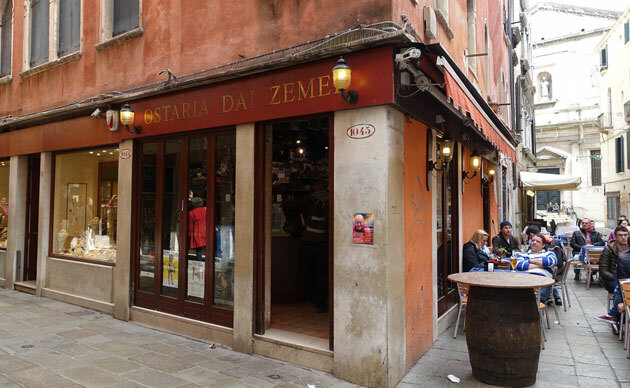 After our light lunch we wandered around Venice for a little while before our grumbling stomachs reminded us that perhaps three cicchetti each wasn’t quite enough for lunch…luckily we were just outside Ostaria Dai Zemei so we popped in for a pick-me-up. 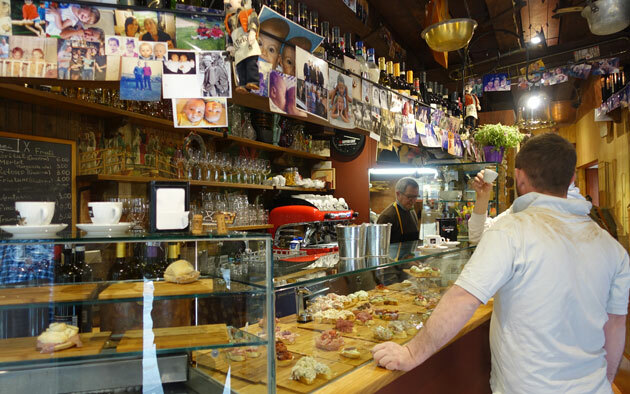 The bar is decorated with photos of twins from all around the world, a nod to the owners of the bar Franco and Giovanni who are twins. The photos date back decades, with black-and-white photos displayed right next to square-sized Instagram-worthy twin shots. 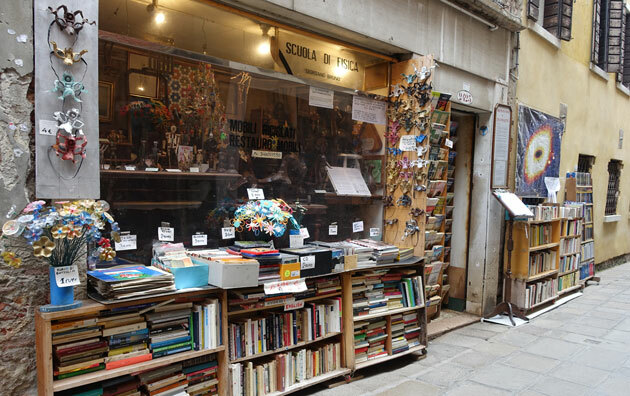 The cicchetti here are a little more expensive at about 1.80 to 2 Euro each, but paying a little bit more is worth it as you get much more topping on your cicchetti! 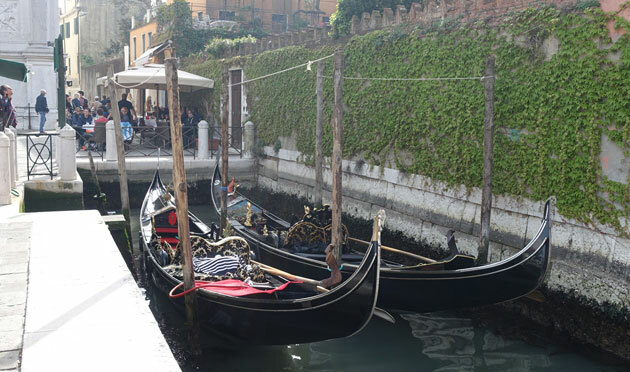 We ordered a sardine and artichoke cicchetti, and a ham and mushroom cicchetti. The sardine and artichoke was incredible, with the smoky artichoke enhancing the strong salty sea flavours of the sardine. What a winner. 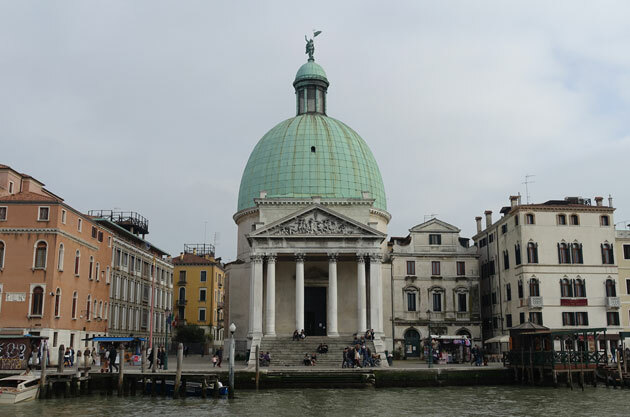 Ostaria Dal Zemei is located at 1045 Sestiere San Polo in Venice, Italy. 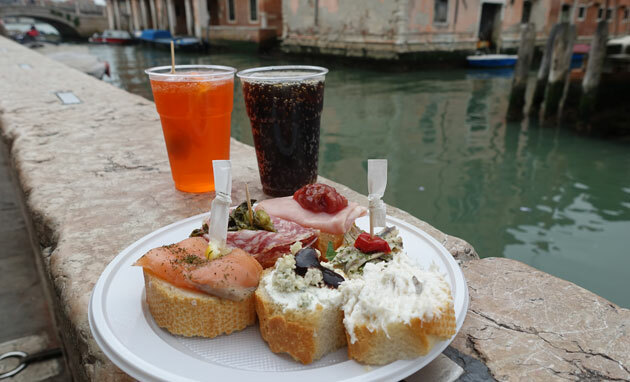 As much as I love it, you can’t just eat cicchetti in Venice! I recommend going outside of the tourist areas to find a ‘proper’ local restaurant. 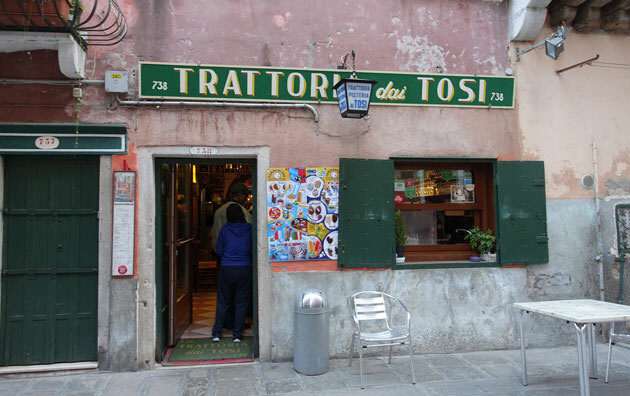 In our case, we went to a little restaurant in the Castello area called Trattoria Dai Tosi, frequented mainly by locals having a drink at the bar. Run by a young man and his mother, it brings alive the true meaning of a family-run restaurant. 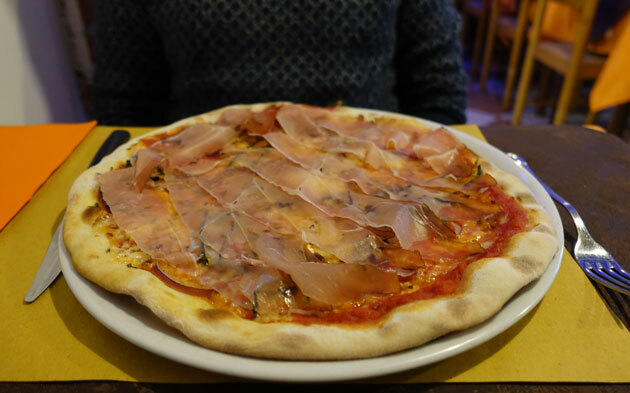 We ordered two pizzas, and they were quite simply the most delicious pizzas we’d tasted in Italy – better even than Mangia Pizza in Florence. Their secret? 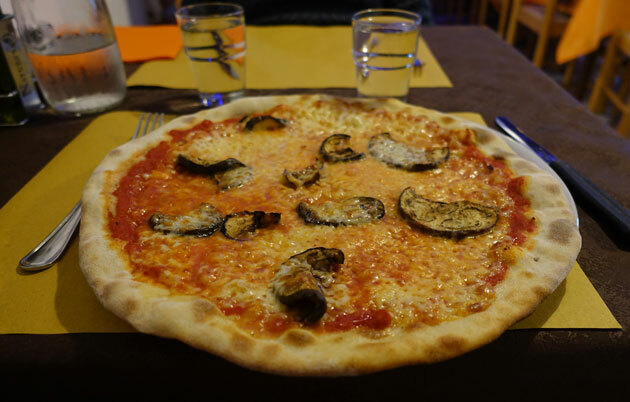 Using only completely local ingredients (the eggplant for my melanzane pizza was grown on a nearby island!) and making sure that all the ingredients are always as fresh as can be…so of course, they have a meat slicer at the bar where they sliced the prosciutto for K’s pizza only when it was ordered. Incredible. 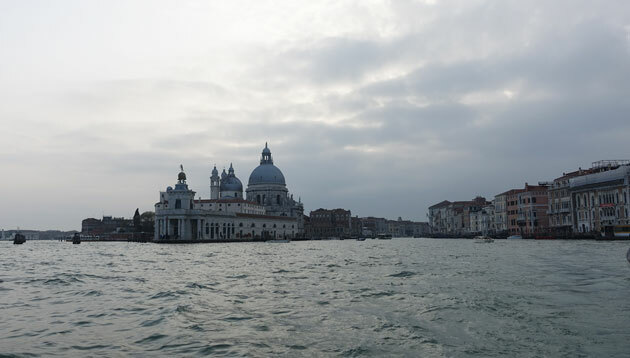 As for the rest of your time in Venice, I suggest investing in a vaporetto (public water boat) pass which will help you get around more easily and see more of Venice from the water. 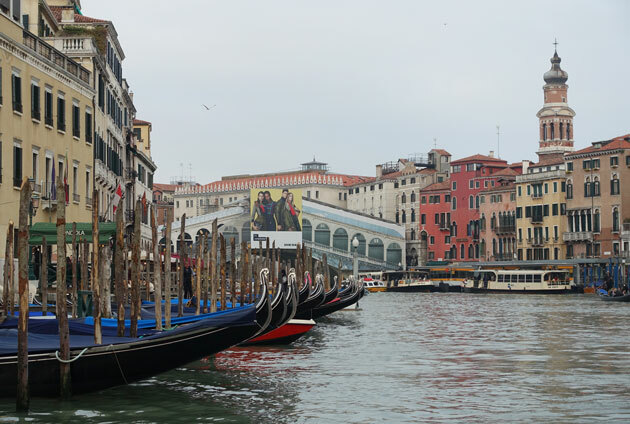 Just take the vaporetto to a random stop, get off, and wander around before jumping back onto the vaporetto to go somewhere else. 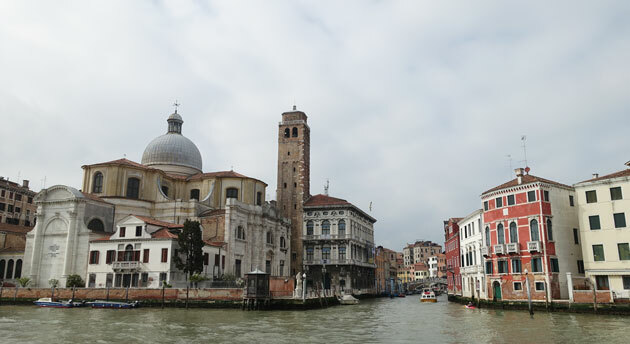 Venice truly is a city best explored on foot and by vaporetto. 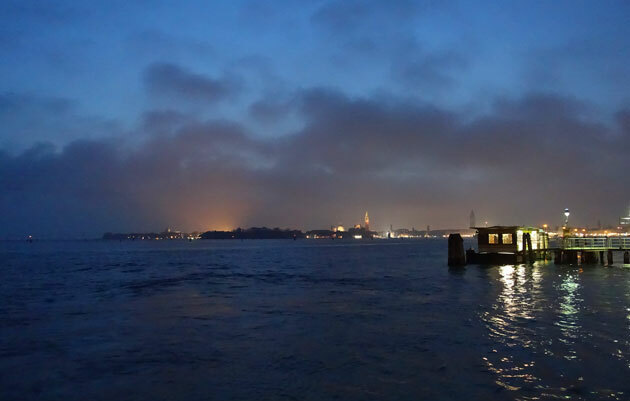 One ride is 7 Euros, so if you plan on taking the vaporetto a few times, buying a one or two day pass might be a better idea. 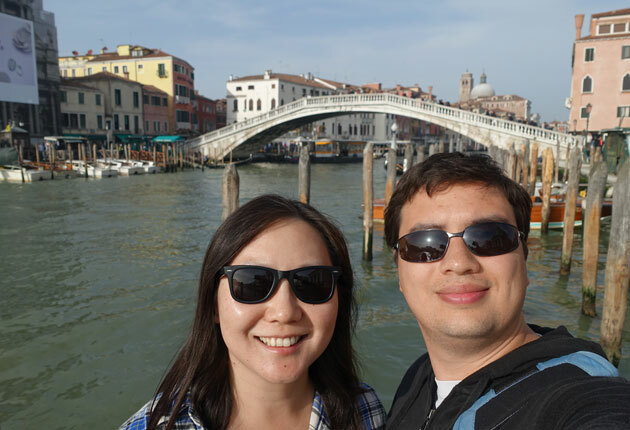 We spent only 36 hours in Venice, but found that sufficient for just wandering around exploring the main islands and seeing the sights. We weren’t particularly keen on going to museums (a bit museum’d out!) 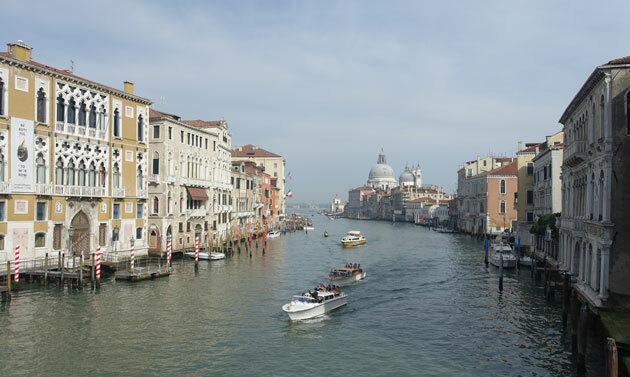 or visiting the other islands, but you could easily add on an extra day for each of those activities if you wanted, spending up to four or five days in Venice. Any more might be overkill I think…it’s small and quaint for a short visit, but doesn’t hold much appeal for me beyond that. 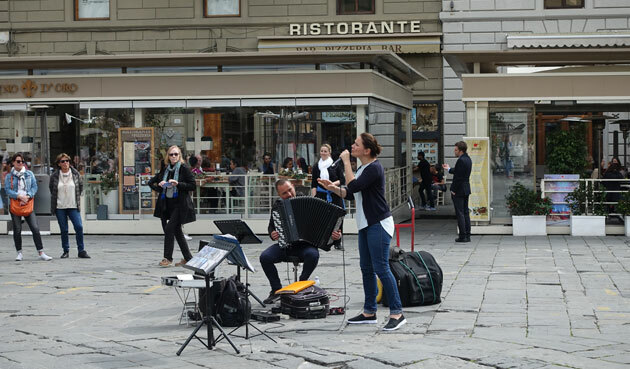 After the hustle and bustle of Rome, Florence felt like a breath of fresh air. 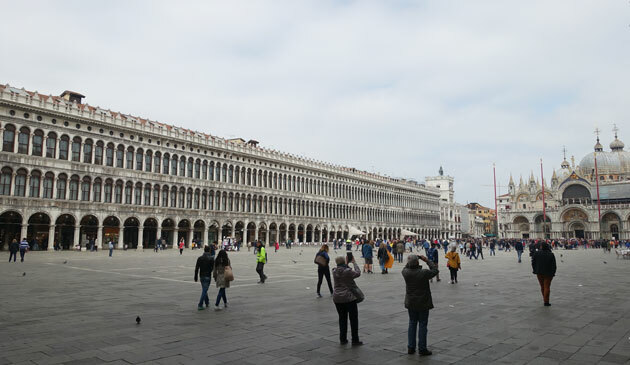 While there were obviously still tourists around, they seemed mostly to be local tourists – Italians making the most of the Pasqua holidays by seeing more of their own country. 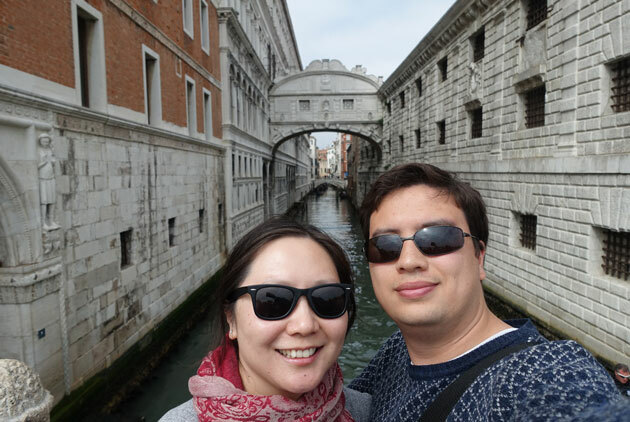 There wasn’t the shoulder-to-shoulder crowds that we experienced in Rome, giving us a lot more space and freedom to explore at a leisurely pace. 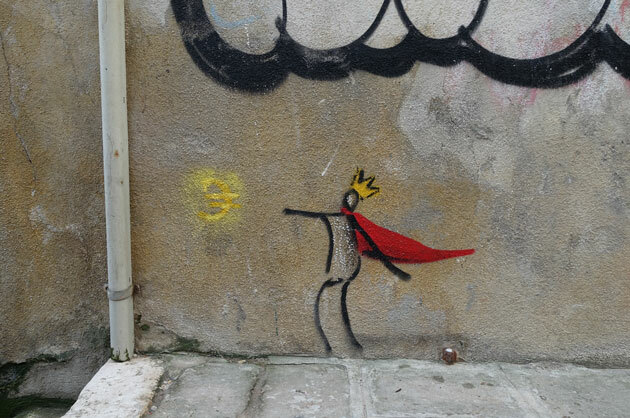 There were other more appealing things about Florence, like the little marks of individuality that we could see everywhere. 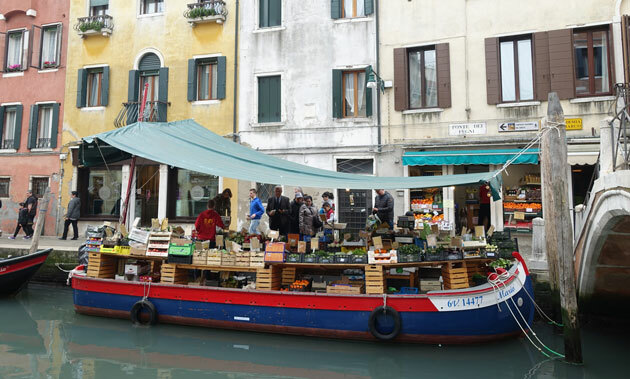 Many of the shops were independently owned and offered hand-crafted or personally designed items for sale. For example, there was a dress shop close to our apartment whose window display made me drool every time I walked past – it was the perfect collection of retro dresses that give one the perfect hourglass silhouette. Absolutely stunning. 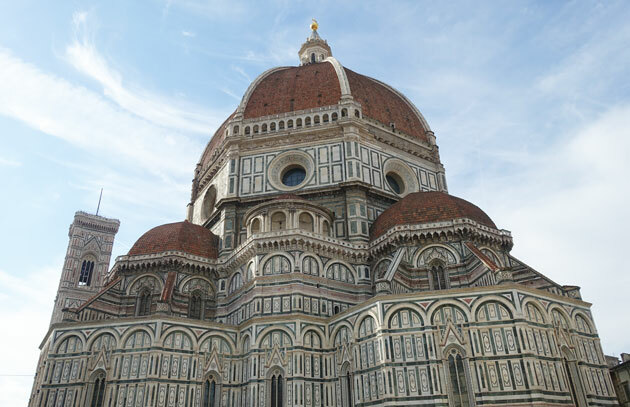 As a city, Florence has truly been defined by its flourishing banking and cultural past, of which the Medici family is an integral part. I knew a little bit about the Medici family through my interest in one of its members, Catherine de Medici, Queen of France, but not much beyond that. 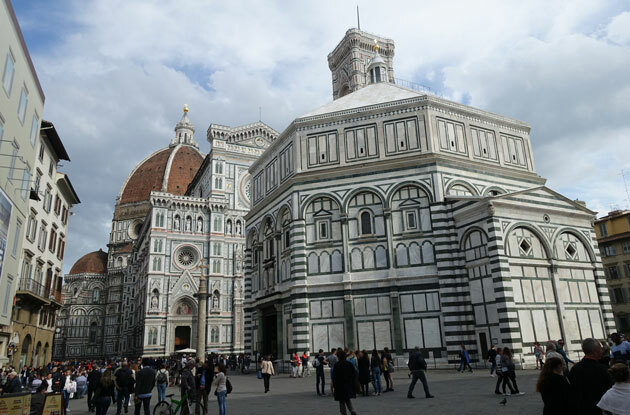 Luckily we took both of the walking tours with the Florence Free Tours, one of which focused on the influence of the Medici banking family on Florence and learnt a lot more! 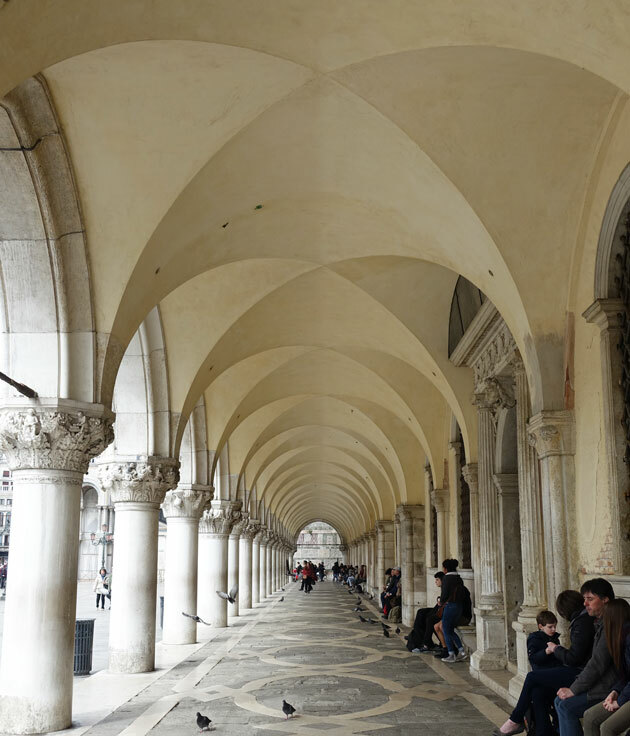 With two queens, three popes and countless nobles in the family, it was fascinating to learn about how an unknown family of commoners managed to rise in fortune and fame to become one of the most celebrated and feared families in Europe at the time. 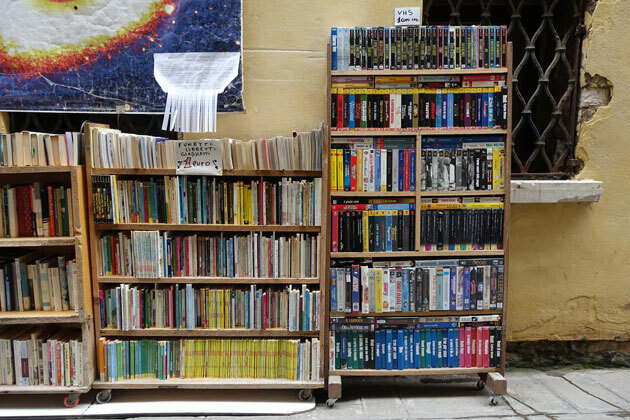 I highly recommend the tours to all who visit Florence. 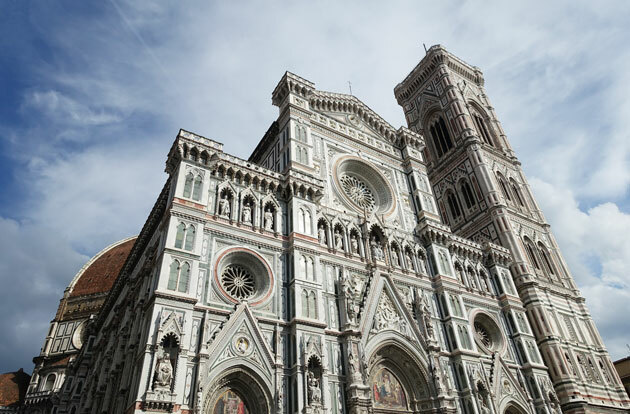 We also climbed the stairs up to the top of the Cathedral of Santa Maria del Fiore which would be considered a workout even for fitness fanatics! 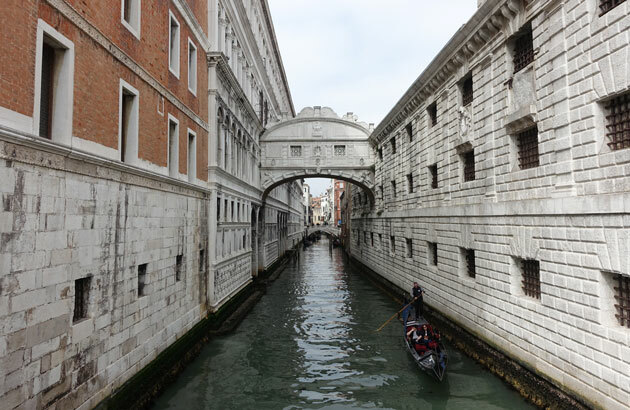 The views are worth it, but do be prepared to be crowded and to do some tight squeezing past people in narrow corridors and stairways up to the top. 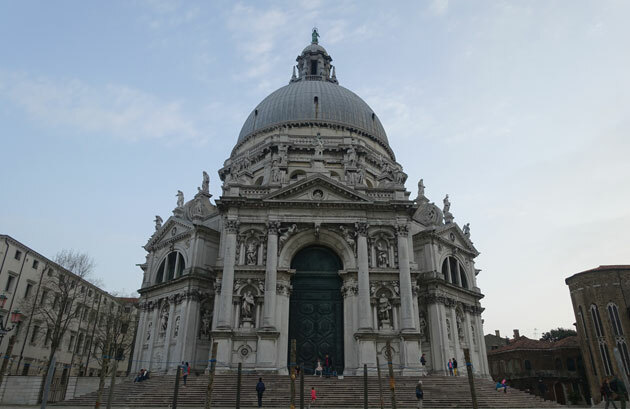 The crowd control could be done a lot better in the tower, but you just have to assume that it’s the Italian way to be relaxed about things like safety standards and number of persons up on the top of the dome! 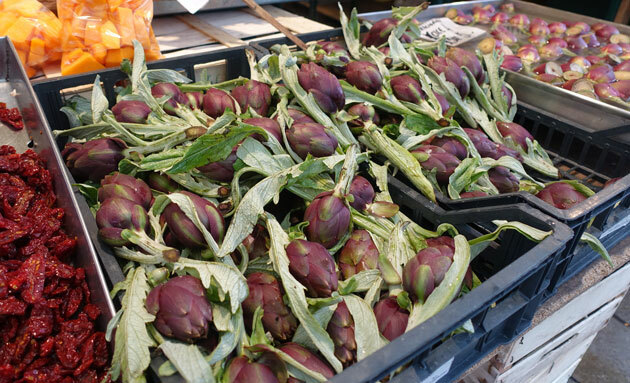 Food-wise, Florence has a lot to offer. 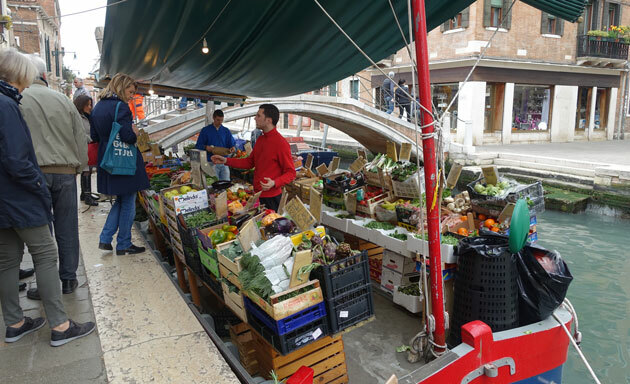 While they have a big central market, our Airbnb host recommended a smaller local market to us. 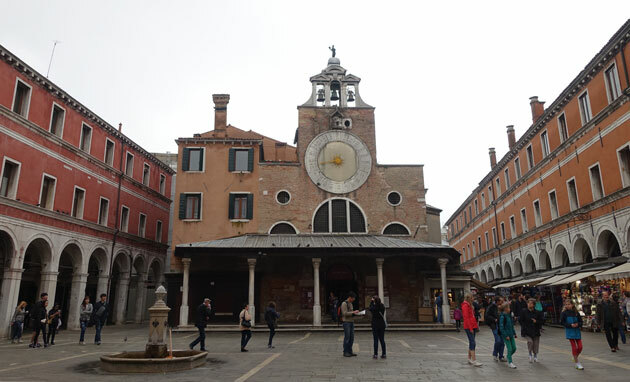 The Mercato Sant’Ambrogio is a morning market frequented by Florentine locals, and offers gorgeous produce, meats, bakeries and fresh-made pastas at a fraction of the price of the main market. 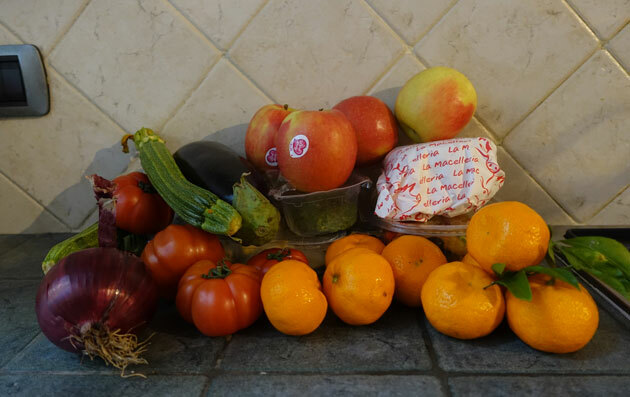 We picked up a good haul to help us cook some delicious fresh and healthy meals at home. 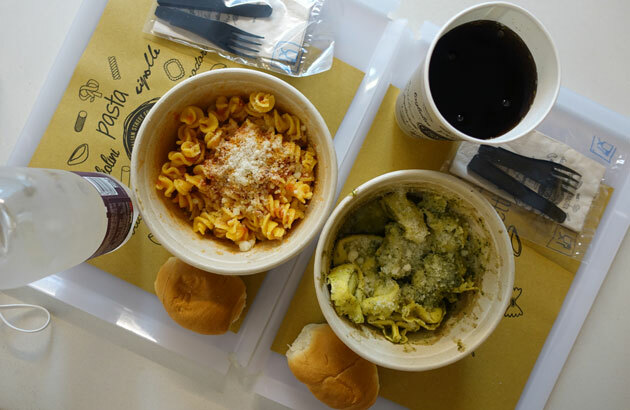 Don’t forget to eat out though – we had great sandwiches at All’Antico Vinaio and pizza at Mangia Pizza. 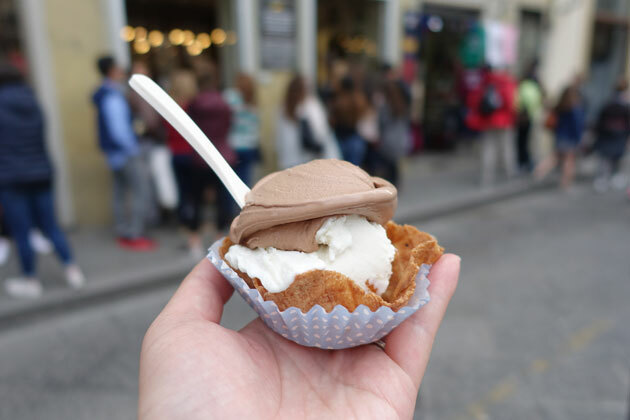 We also had our fair share of gelato from local gelaterias as well of course! 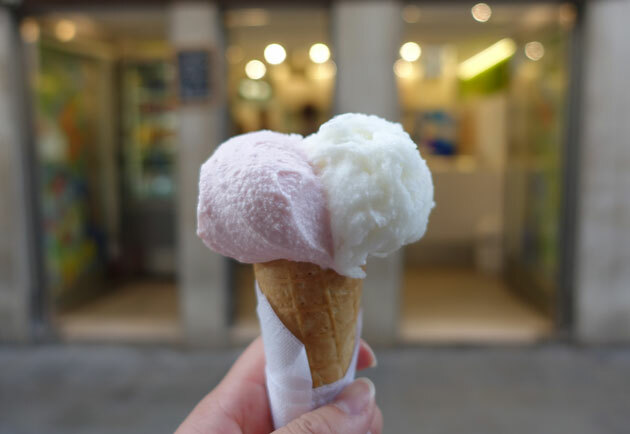 RivaReno Gelato has a shop in Florence, and I also enjoyed Edoardo Gelateria (bio/organic gelato!) 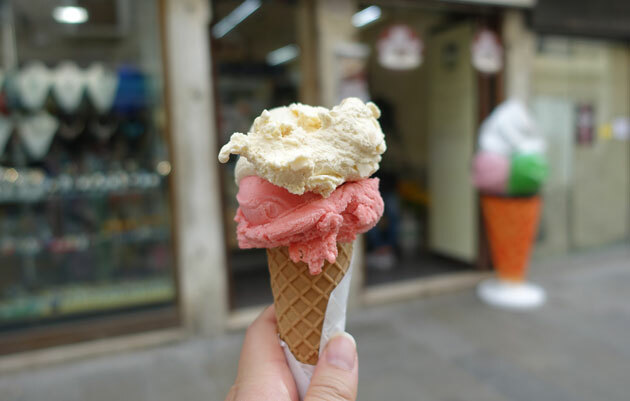 and Marco Ottaviano who do low-calorie low-sugar gelatos as well for those watching their figures! 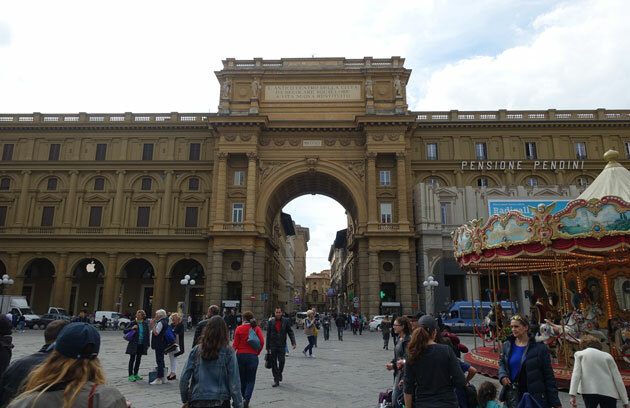 Florence is a wonderful city to visit. 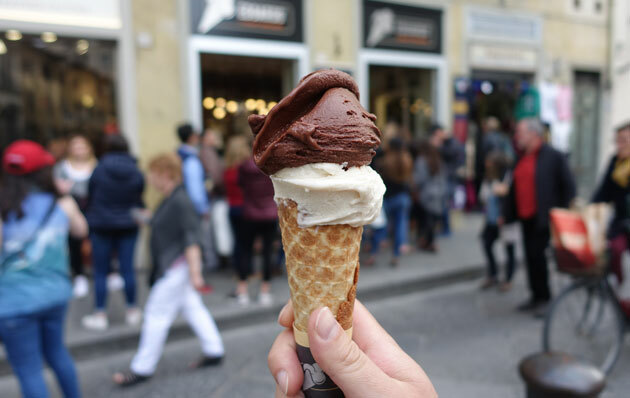 Life is lived at a slightly slower pace here, and I began to feel much more at home in Florence than I ever could in Rome. 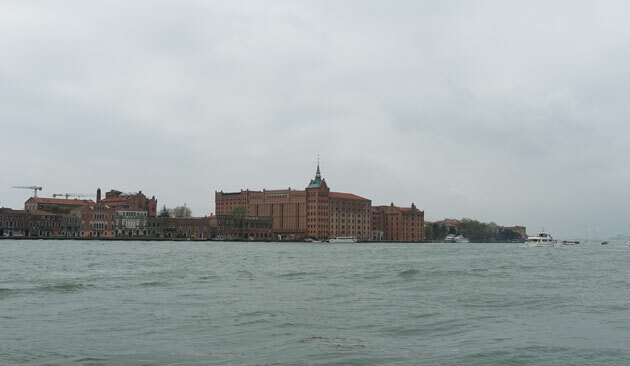 The history and the culture appeals to me, the food is superb, the city has a much more individualistic flavour. I’ll definitely be back. 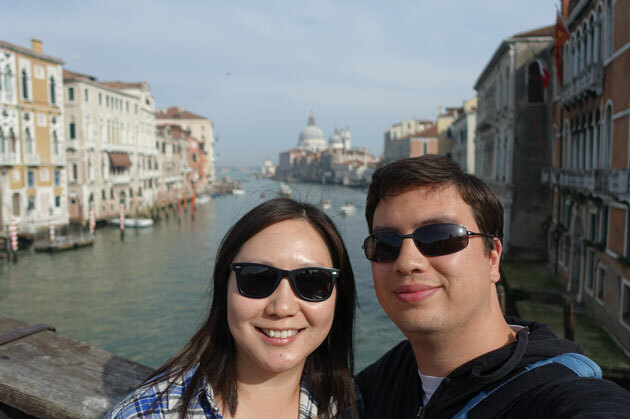 Next time, I hope to explore more of Tuscany, instead of just sticking to Florence and Pisa!